My grandmother always made popcorn balls for Halloween. I never did get her recipe, but I knew it was one of those cooked ones that involved a candy thermometer. I was looking for something that might be a little easier than that. I had seen some recipes that were basically melted marshmallows and popcorn, made like rice krispie treats, but I wanted a different flavor than that; more of a caramel flavor. I did a little research and a couple of experiments, and came up with these. Sweet and salty, gooey and chewy, this was the exact flavor I was looking for. 15 to 16 heaping cups of popped popcorn (scant 3/4 cup unpopped kernels); I used air popped. 1. Place popped popcorn into a very large bowl (I used a clean dishpan). Try to make sure all the unpopped kernels are removed- no one wants to bite into one of those! Hold a heaping cup of popcorn back to have in reserve if needed. Set aside. 2. In a saucepan over medium heat, combine the confectioner's sugar, marshmallows, corn syrup, butter, water, and salt. Heat and stir until mixture is smooth and comes to a boil. Remove from heat. 3. Carefully drizzle hot syrup over popcorn, stirring the popcorn while pouring. Mix well, making sure all the popcorn is evenly covered. If there seems to be an excess of syrup, stir in the extra cup of reserved popcorn. Grease hands with cooking spray. Working quickly before the mixture cools, shape the coated popcorn into balls. Set on parchment paper, without letting the popcorn balls touch, until completely cool. Wrap in plastic wrap or cellophane and store at room temperature. Best that day. Notes: In one batch of the popcorn balls, I used light corn syrup instead of dark. You can see in the pictures that some are slightly darker than the others. The lighter ones tasted fine, we just preferred the more caramel-y taste that the dark syrup provided. Adapted from allrecipes.com, and shared at these fun parties. Pam, I loved the no-thermometer part, too! I was happy to be able to make these without one! :) Thank you for coming by! I remember my mom making these years ago! You just sent me on a wonderful trip down memory lane. Thanks Joy! Thank you for this recipe! I, too have memories of popcorn balls from grade school! I brought home a slip of paper reading "25 popcorn balls" for my 1st grade Halloween party. Mom and dad FREAKED out! Anything but those! They didn't have a clue how to make them! Well, since you don't exactly call a nun on the phone and tell her you're not bringing them, they figured it out. They were great! But somewhere along the line the recipe was lost so I never made them myself. But whenever I see popcorn balls, I'm back in 1st grade, except now I understand that mom and dad wanted to send only a perfect treat to school with their oldest daughter on our first party assignment! Oh, Joyce, what a wonderful story!! I can just see a couple of young, anxious parents, wanting their sweet little daughter's assignment to go well! Wouldn't you love to have that recipe! :) Thank you for telling me about your popcorn ball memory! These do sound wonderful and they do bring back wonderful memories of getting them in my trick or treat bag! I vaguely remember my Dad making them but mostly I remember eating them! What fun! Now you've got me remembering childhood memories of trick or treating- when you could get homemade treats in your bag and it was OK. :) I know you've got some fun things planned for Amara this Halloween- I can't wait to read about them! My husband would love these!! All your recipes look so good! Autumn yummies! Thank you for a delish visit from the Grand Social! Wow - it's been years! 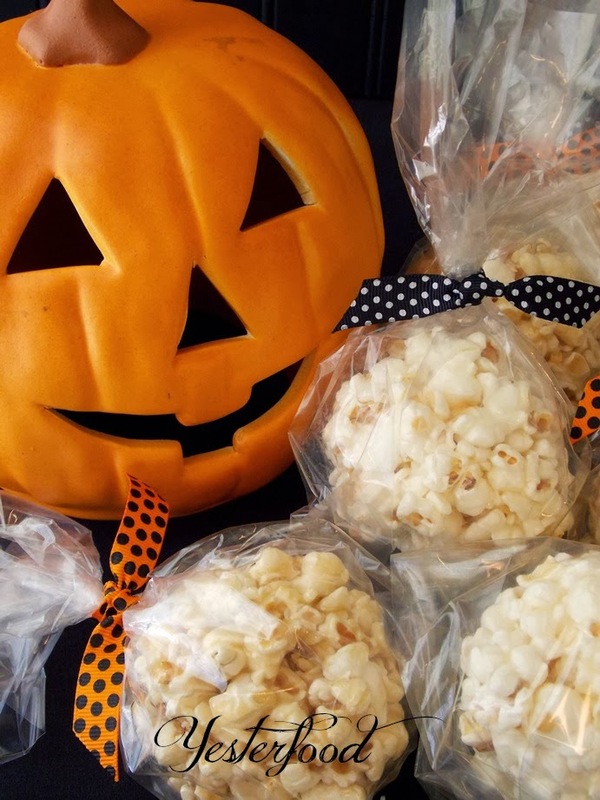 Is there anything more quintessentially Halloween and fall than popcorn balls? Thank you for sharing. Stopping in from Lisa's Grand Social. Barb, they were a Halloween tradition for us when I was a kid, and I wanted to bring it back for my grands. :) Thank you so much for coming by! Hi Joy, these popcorn balls looks so yummy! This is something that my daughter and I would love and thanks for sharing at kathe with an e.
Oh my goodness, Joy--I am grinning like a fool over here. First, my mother in law used to make popcorn balls for Halloween and she'd get so excited about it (she doesn't cook much anymore). Second, I have a very old post about popcorn balls that did require a candy thermometer. And my candy thermometer decided to die. It was an utter mess! I'll have to try this non-thermometer recipe. Thanks for linking! Oh, Michelle, I’m so glad you liked them- my Grandmother got excited and happy about making them, too, so these meant a lot to me! I was really happy to start the tradition back up for my family...I don’t know what took me so long. They’re not *exactly* the same (as thermometer popcorn balls), of course, but they bring back the tradition and the Halloween spirit, I guess you’d say, that I was looking for. :) I remember my Grandmother’s popcorn balls being a little crunchier, which you’d get with the hard ball stage syrup. These are a little chewier, I think, but they have a really good caramel flavor. Hi Joy! Stopping by from Wake Up Wednesdays and had to come check out your Popcorn Balls - I haven't had them in years. 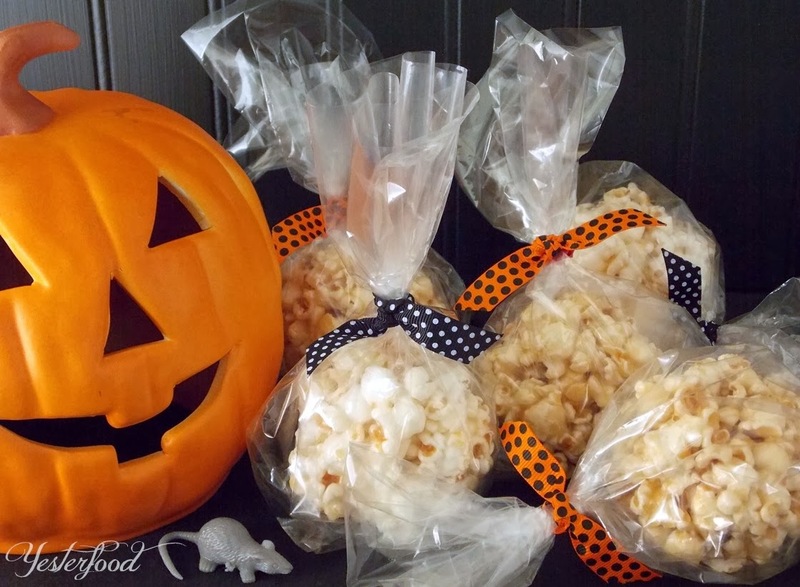 Totally take me back to a kid - Halloween party at school with what else - Popcorn balls. Definitely need to make these with my son! Pinning! Hi Joy. Thanks for linking up this amazing Caramel Popcorn Balls recipe to my SWLP, I appreciate you! This is such a fun festive treat!! This is pinned to the Wake up Wednesday pinboard. Oh my gosh! This is such a throw back for me. I remember having these as a little girl. During those times, most people made everything due to having little money. It's so easy to pop in the store now and get everything. Brings back memories.... Think I may have to try these with my kids, for sure. What a great memory of getting these as a kid. thanks so much for sharing this healthy halloween treat with us on foodie friday. They're kind of a fun blast from the past, aren't they? :) Thank you for coming by, and for hosting! I just love Popcorn Balls and your Caramel Popcorn Balls look awesome! Thank you so much for sharing with Full Plate Thursday and hope you are having a great weekend! This is the second popcorn ball recipe I've seen today. I think it's a sign! Perhaps we should make some for Halloween. ;-) I like to make them as stocking stuffers, as well. Gotta try this! I have a bag of marshmallows just waiting to be used. Thanks for the recipe...I willl check out some others you have. It's not fall without popcorn balls! I love making these for the kids every year! Thanks for sharing at Saturday Night Fever! That looks like a great recipe. I haven't had popcorn balls since I was in elementary school! Pinning these so I can make them for my kids, and myself of course. Also, I love the ribbons you used. So festive and pretty at the same time. Odd as it sounds the H and I were having a conversation about caramel corn and popcorn balls (me,"You know what you never see anymore? Those popcorn balls." The H, "Grrr" Or maybe it was "Ugh." Anyway a grunt of acknowledgement.) So I was happy to come across this recipe and your lovely blog. I'm making this post my Pick of the Week from Snickerdoodle Sunday. Stop by and grab my featured at button when you have a chance. Now following you, here and on Pinterest. Have a great week! My son heard about popcorn balls at school and has been wanting to try them. I like this simple method. I have such fond memories of caramel popcorn as a kid. Yummy salty sweet snack. Thanks for sharing on Merry Monday! Hi Joy I am coming from The Pretty Pinterest party. I like Rachel have memories of my grandmother making popcorn balls, but then they were using whole cream, and butter to make the, OMG they were wonderful!!! I am liking your version of this recipe, thanks for sharing. I would love it you would stop by and share on Oh My Heartsie Girl this weekends party!!! G'day! Love this recipe Joy! Thanks for sharing at our #SayGdayParty! Cheers! Joanne @ What's On The List Pinned! Popcorn balls always, always remind me of Halloween. Thank you for sharing, Joy. Love the little treat bags too! Thanks for linking up with us last week at Teach Me Tuesday. We very much appreciate having you. Hope to see you again this week. Starts Monday evening @ 8pm CST. My son would love these popcorn balls! Thanks for coming and linking up at The Weekend Social. All posts get pinned in our pinterest board! Please be sure to come back next week starting Thursdays at 9PM EST on culinaryflavors.gr ! I hope to see you there! I remember these from when I was a kid too. Thanks so much for linking up to Dare to Share this week. You are today's Dare to Share Feature of the Day! 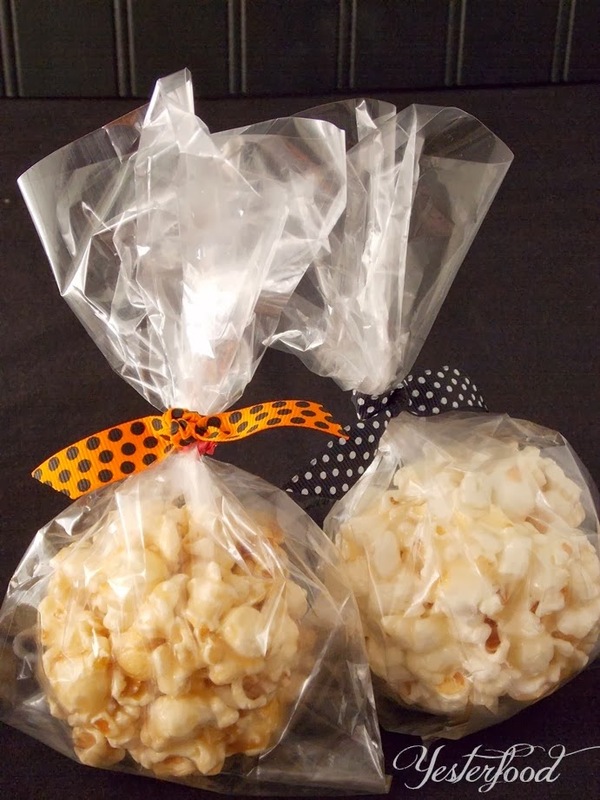 What a great treat, we will love your Caramel Popcorn Balls. Hope you are having a great week and thanks so much for sharing your great post with Full Plate Thursday. Love caramel popcorn balls. Cute packaging with the ribbons too. Thanks for linking up at Show Me Saturday! Hope to see you there again this week. What's a Halloween without popcorn balls? Thanks for sharing your recipe @DearCreatives party!